PDUs, or Professional Development Units, are used to measure the time and effort a project management professional spends in maintaining his or her PMI certification. To maintain their professional qualification, the PMI uses Continuing Certification PDUs. Many of SPOCE’s courses are project management related and therefore relevant to professional development. You can claim PDU’s from relevant courses regardless of whether the provider is registered as a PMI ‘Registered Education Provider.’ Here is your guide to claiming your PMI PDU’s for SPOCE courses. For the PMP certification, you will need to claim 60 PDU units over the 3 year cycle towards your re-certification. PDU units can be gained in various categories that are divided in to two types: 'Education' and 'Giving Back to the Profession'. Is SPOCE a PMI REP? No. We are recognised under the University / College / Training Organisation not registered with PMI. At present we do not provide our own PMI courses and therefore are not required to register under the PMI REP (Registered Education Provider) program. PMI spot-check entries for their CCRS program and so may check that you are eligible for the PDUs claimed. PMI may check up to 18 months after the end of your CCRS cycle. You should retain the following as proof of your course attendance: Course Brochure/Outline, Registration / Joins letter, Certifications earned, Training Organisation details and Trainer qualifications. 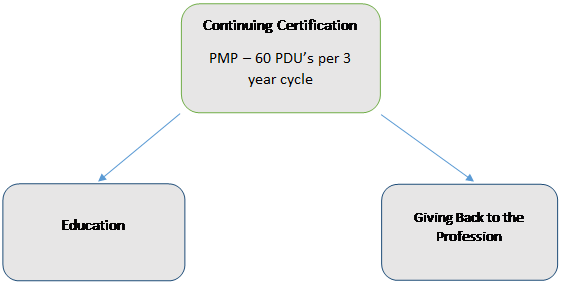 Depending on the PMI qualification you are supporting, you may need to earn upto 60 PDUs in a 3-year cycle viz. PMP and PgMP require 60 PDUs, whereas PMI-ACP, PMI-RMP and PMI-SP require 30 PDUs. PMP has a limitation in that only 30 PDUs per cycle may be claimed for Self-Directed Learning. How do I claim my PDUs? The PMI’s scheme requirements state that each hour of professional development undertaken is equivalent to one PDU. The activity should also be relevant to the area of expertise covered in the PMP certification. A full list of SPOCE courses, which can be used to earn PDUs, is available under a Tab above and includes an approximate number of instructor-led hours for each course. Instructor Qualifications – All of SPOCE’s course instructors are formally accredited by the APM Group and meet the ‘approved trainer’ requirements of Axelos.